Over 70 technology leaders from 19 countries will be displaying their latest solutions at this year’s Nigeria Agrofood & Plastprintpack Fair with a view to boosting food safety and diversity in the country. This 3-day Fair scheduled for 26-28 April, 2016, in Lagos. 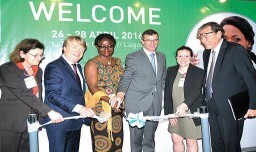 “Agrofood & plastprintpack Nigeria supports the Nigerian agrofood industry to meet its challenges in terms of food hygiene, food safety, cost efficiency and creating an ever greater diversity of food and beverage products”, says Martin März, Managing Director of the German trade show specialists fair-trade. The countries expected at the event are Austria, Benin, China, France, Germany, India, Morocco, Netherlands, Nigeria, Poland, South Africa, Spain, Thailand, Togo, Turkey, Ukraine, United Arab Emirates, United Kingdom and USA.